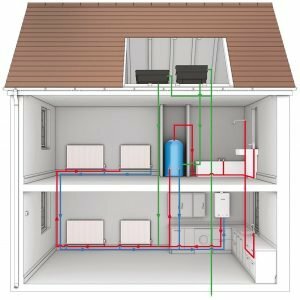 If you are replacing an older model of boiler, the chances are that you will have a regular (also known as ‘conventional’) boiler.A typical regular boiler system incorporates a boiler, extended controls, a hot water cylinder which is often fed by a cold water storage cistern located in the loft and a feed and expansion cistern – also located in the loft. You have a stored water supply (normally 50 gallons 227 litres). You heating system works under a low pressure. If you hot water cylinder has an immersion heater (electrically heated) you have hot water back-up, in case the boiler fails. Poor water pressure on both hot and cold taps, except the cold at the kitchen sink which is main water pressure. You heat the water in the hot water cylinder to 60 degrees than may not use it all. You have water pipes and cold water storage cistern in the roof which may leak or freeze.